Today I have a quick announcement about the Credo Freelancer level, which is the $100/mo level as outlined on the Pros page. First the tl;DR on the change, then the back story about why I made it. The change was actually rolled live yesterday (Thursday) and all the Freelancers notified. And yes, it’s only a good change for Freelancers! All Freelancers can now contact up to 3 projects, both from their profiles and open projects, per month on Credo. They will also now receive notifications when a project they qualify for is created on the platform. This is a change I’ve been wanting to make for quite a while. Members on the Freelancer level to this point have only been able to get clients through their public profile on the site (every Credo member has a public profile with a form on it), but I’ve not been able to really say with certainty that they’ll always get 1-2 contacts a month through it. With this change, I’m aiming to open up the pool of people each project creator may be contacted by. I’m also aiming to reduce churn on the Freelancer level, as now they’ll be getting even more value! I have some other big changes coming up end of the month (assuming no major development delays), but for now this is live. If you’re a Freelancer, you’ve already received an email about this. Reply there with questions. 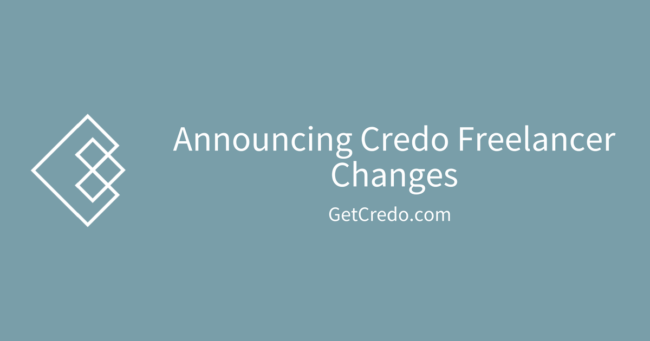 If you’ve considered joining Credo but weren’t sure yet, this is a great time to get in. Start that process here.